Another nippy SSD, but is it worth it when larger SSDs are around? To RAID or not to RAID. That is the question. At least, it's an increasingly interesting question with the number of smaller, more affordable solid state drives (SSDs) on the rise. The latest example of just such an SSD is the new G.Skill Phoenix Pro 40GB. The key issues here are performance, capacity and cost. SSDs deliver a number of knock-out performance and efficiency advantages compared to conventional drives, which are based on rotating magnetic platters. But they also tend to be much smaller, while costing a bundle more. Consequently, this relatively puny 40GB SSD is priced on a par with magnetic drives offering 1TB or more. In fact, it's debatable whether 40GB is actually big enough to be useful as even a boot drive. With that in mind, one obvious solution is pairing up two 40GB drives in a RAID 0 array and thereby doubling up capacity at the same time as pushing performance to a whole new level. If a single SSD delivers a massive improvement in storage performance against the clock and subjective computing experience, then just imagine what a pair in RAID will do. If that's got your attention, the G.Skill Phoenix Pro 40GB is certainly a promising candidate. 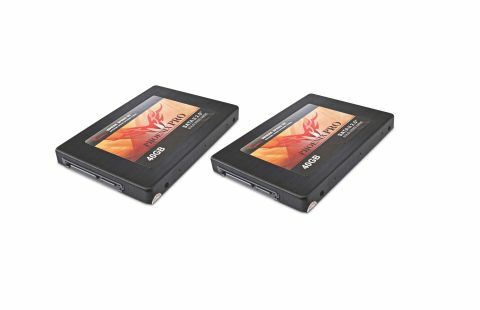 It's powered by the SandForce SF-1200, which is arguably the best SSD controller chip currently available and certainly one of the most popular around.